Rare clouds in the shape of jellyfish have caused a sensation after being spotted in skies above Lutterworth, Leicestershire for the first time in a decade. 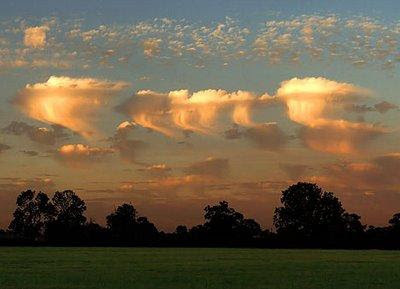 The unusual clouds known as Altocumulus Castellanus have not been seen in Britain for 10 years. Their presence indicates stormy weather may soon close in. The rare clouds' unique "jellyfish" shape forms when a rush of moist air comes from the Gulf Stream and gets trapped between layers of dry air. It is thought these probably developed as a result of recent tropical storms in the Atlantic.